You’ll be surprised to find out what’s hidden under the surface of Lake Wakatipu; and it might make you think twice before taking your next dip in the lake when you learn about the slinky eels and massive trout. Found only in New Zealand, these eels can live up to 90 years old and weigh up to 16kg. 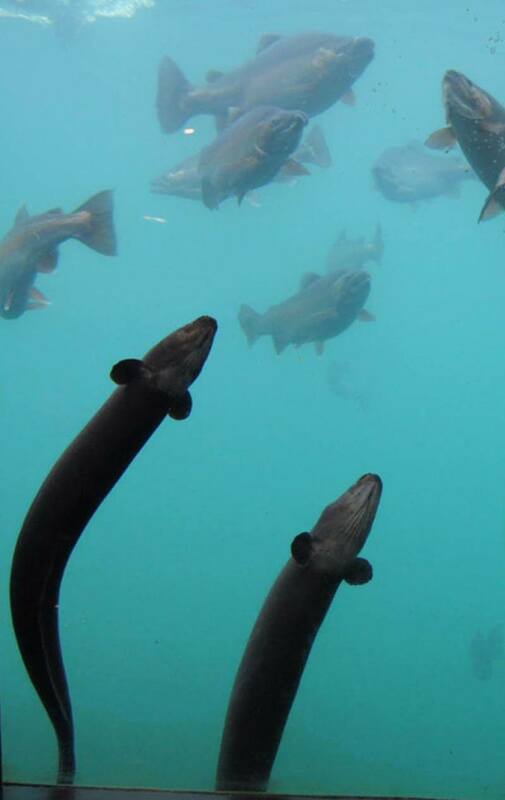 Most of the eels seen in Lake Wakatipu are female with an average length of 115cm – male Longfins grow to an average of 74cm and prefer to live in the lower river regions. The New Zealand longfin eel is one of three fresh water eels found in New Zealand. The other two are the shortfin eel and the Australian longfin eel. Longfins have poor daytime vision but an excellent sense of smell. They spend most of their lives in fresh water, travelling out to the ocean only once to spawn and die. They also have a slow reproduction rate, breeding only once at the end of their lifetime. 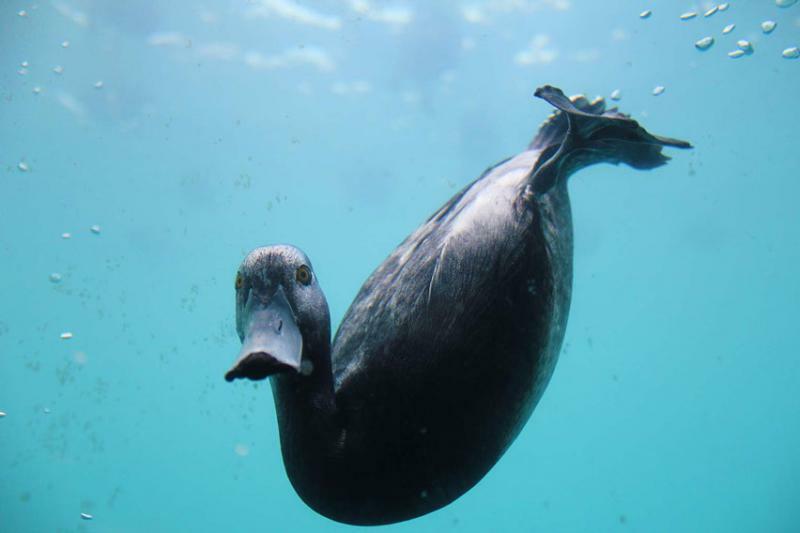 The scaup duck, commonly known as black teal, is New Zealand’s only true diving duck. They spend a lot of time underwater, where they can travel considerable distances. Scaup are dark brown/black in colour. The male has a striking yellow eye and a dark coloured teal head. The female is similar to the male, but without the yellow eye and has a white face patch during breeding season. When in flight a white wing bar can be seen in both sexes. They can dive up to 8 metres deep and stay underwater for up to 45 seconds. 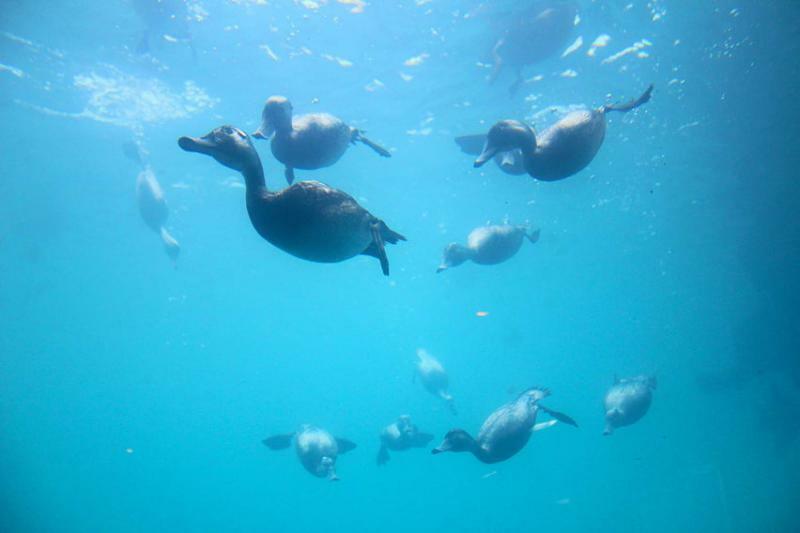 Air trapped in their feathers makes their dark plumage look silver when underwater. The scaup, being a native bird, is fully protected in New Zealand. Most of the fish in Lake Wakatipu are rainbow trout. They live up to 9 years of age and weigh about 1-2kg but can reach in excess of 5kg. Rainbow Trout have small spots on their upper back and tail, and white tips on the fins. Brown trout can be identified by their larger spots and brown/gold colour. They live up to about 15 years of age and weight between 2-3kg. Brown trout congregate around the lake edges and feed on insects from nearby vegetation. Trout were introduced to New Zealand over 100 years ago – the rainbow trout from USA and Brown trout from Europe. Trout are territorial fish, so the trout that you see at the Underwater Observatory may well stay here for the rest of their lives. Many will leave for a few weeks during the winter to travel up the rivers to spawn, but most of the fish will return after spawning. Chinnook salmon also known as quinnat salmon are native to the north-west coast of north American, and north-east Asia. Male and female species have different colouring. The female is silver in colour with black spots along the back and the male is orange/brown in colour with black spots along the back. Males also develop a large hooked jaw near spawning. Most chinook salmon in New Zealand weigh between ten to fifteen kilograms and are up to a metre in length. Some individuals can be substantially larger than this and chinook salmon in their native range are known to reach a metre and a half in length with the largest salmon on record having been caught off the coast of Alaska and weighting in at 59 kilograms. 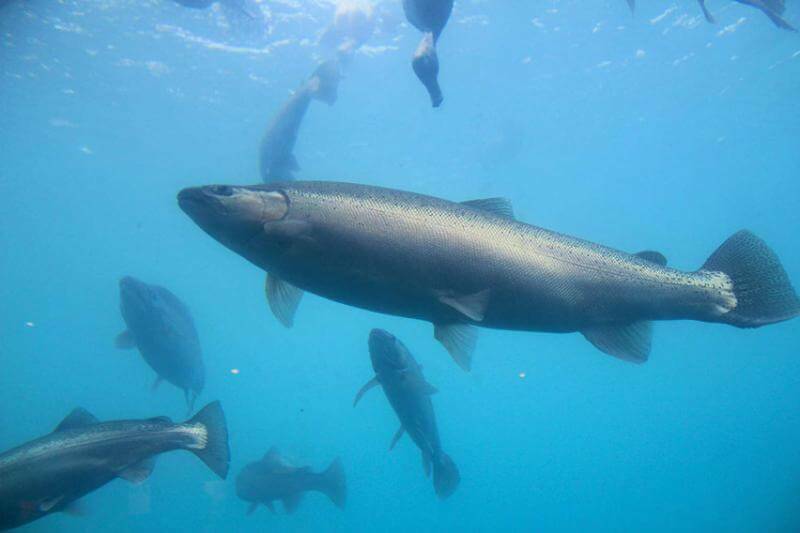 Lake salmon do not grow as big as anadromous (sea run) salmon. We do get asked quite regularly if there are any dolphins in the lake. Dolphins are primarily a salt-water dwelling species of mammal and as the lake is completely fresh water land locked there are no dolphins, whales or sharks living in Lake Wakatipu. However, you will possibly be able to see dolphins if you go on a cruise in Milford Sound. 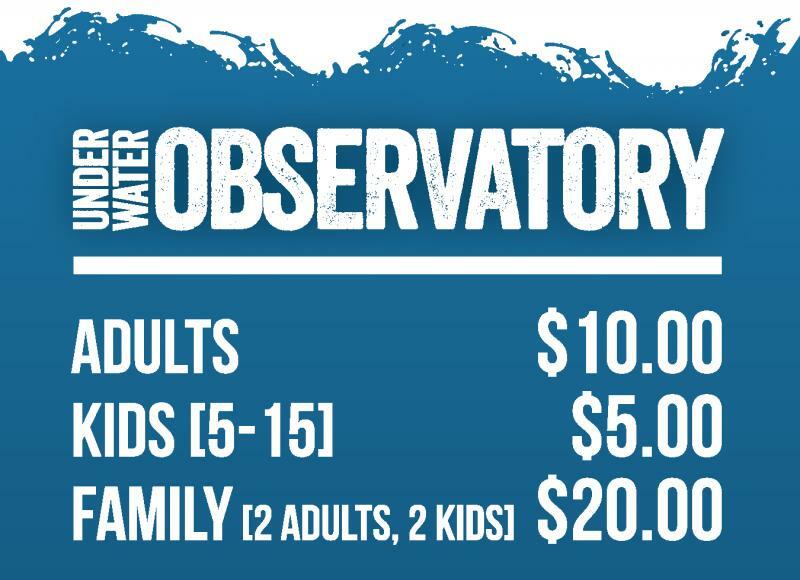 You can view Lake Wakatipu’s inhabitants at Queenstown’s Underwater Observatory located on the Main Town Pier; one of the best value attractions in Queenstown. FREE entry is included with every KJet ride and Southern Discoveries Queenstown Lake Cruise.